The other day was one of the toughest I can remember. 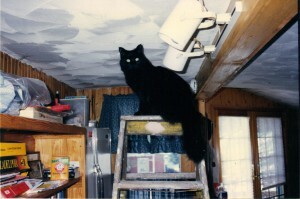 It is never easy putting our pet companions to sleep, particularly a special cat I knew for the past 18 years. As I write this, I very much miss hearing Anna snore under my desk; I miss her meow; I miss holding and caressing her, but most of all I miss her purring and nudging. Back in 1994 I owned a cool little house that overlooked the Neshaminy Creek. From the street, the only way through my front door was to climb 52 stairs. My neighbor, Nina, who happened to be a retired Russian ballerina from the NYC ballet, had a penchant for felines; she had over 50 of them. She had given me a cat named Merlin, who was very special. He had not been “mixed in” with the others yet, and Nina found him on the streets of South Philly—so I used to tell folks that Merlin was an Italian cat. Merlin was extremely vocal, and polite. He had leukemia, and I had to put him to sleep when he was 7 years old; that was a tough time for sure. 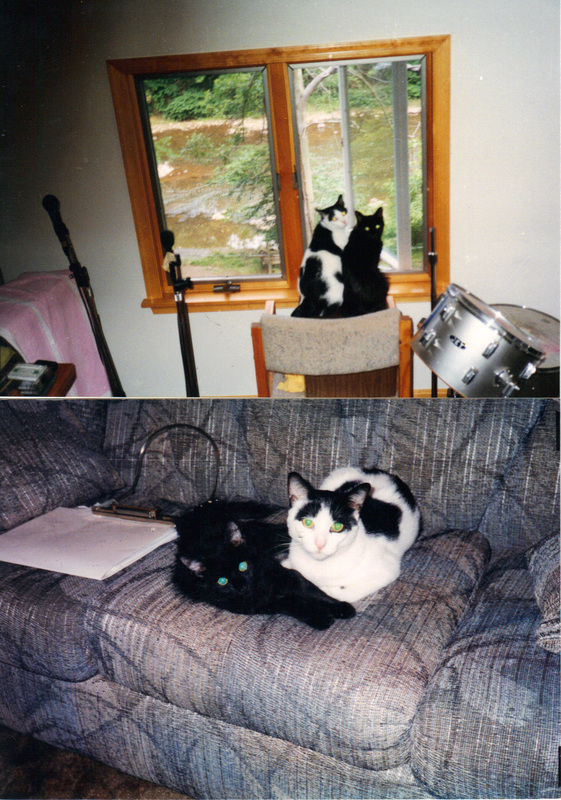 About a month after I adopted Merlin, Nina came across a tiny black cat, who was found on the side of the road, sitting beside her dead mother; her mother had been hit by a car. Nina asked me if I wanted her, and I figured she would be good company for Merlin while I was away at work during the day. I asked her if she had a name and was told “Anastasia”, to which I replied “Anna.” Nina agreed that name suited her. I can remember clear as day, when I would wake in the AM, and Anna would be in her cage, meowing. All I could see was a tiny red mouth, surrounded by a tiny ball of thick jet black fur. Anna, as most kittens, can be devious at night—they love to play, lick and chew a sleeping face, which is why I kept her in a cage at night—this only lasted 2 weeks. Most male cats are quite territorial. But Merlin actually allowed Anna to eat first, waiting until she finished before he ate. He would also groom her several times a day. They ended up being the best of pals, sharing their bed, playing inside and outside, and never, ever, fought. One special memory is when Merlin would be walking near the bed, and Anna would literally dive bomb Merlin. It was really something to see. After I had to put Merlin to sleep, I was concerned about Anna. Do cats have feelings? Yes, they absolutely do! So I went to my local vet and took home a silver striped kitten we named Jake. While Jake is still with us today at 13 years of age, I should have waited longer. It wasn’t long before Jake would dominate Anna—jump all over her, etc. By that time, my wife and I had a small child, and we were able to move into a larger house. For those 5 years, Anna mainly stayed in the basement, where I worked, in order to stay clear of Jake and people. Anna was always easily frightened, and would hide from guests. My brother even called her “Sasquatch” since most people heard about her, but didn’t actually get to see her. Back in 2008, we relocated to an even bigger house, where I had an office where I could get some sunlight and not be in a basement 14 hours a day. I decided to keep Anna in my office, where she would be away from visitors and Jake the cat. She had it made—a clean litter box, food, water, and sunlight in a fair sized space. Since Anna was in indoor cat and seemed healthy, I decided that trips to the vet would only invite stress for her. In fact, my Dad and I had a cat that lived to be nearly 23—and Cinnamon had not visited the vet for several years. Slowly, Anna lost weight, but I just assumed that’s what old cats do. She was still eating and drinking fine. Over time her stools became pebbly and dry, and I should have been more aware and placed her on a wet food diet. I had her mainly on a dry food diet. Whenever my family would go on vacation, I would worry about Anna. She was usually different when I arrived home, but would warm back up fairly quickly. About a week ago, I noticed she was not leaving any stools in the box—or they were real small. Then I noticed she would have a problem getting comfortable—she would circle around several times before trying to lie down. Then I knew she was in pain, even though she still was eating a bit, drinking a lot, and peeing fine. I had hoped the trip to the vet would have been able to clear her constipation—that’s all I assumed was wrong with her. First thing Monday morning (vet was closed on Sunday) I was able to get a 9:30 appointment. I held Anna in my arms for over an hour, and just cried. At the vet’s office, the Dr. asked me to leave her so they could run some tests, and that we may still have a good shot with her. Leaving her in that condition for over 2 hours was not easy—the fact that she may have felt abandoned, after losing her mother, then best pal, still haunts me. Then 2 hours later the call came—her kidneys were shot, she was anemic, and her quality of life could not be restored. Once I make up my mind, I can make and act on decisions quickly. I was able to get my mom to accompany me to the dreaded procedure within the hour. Yes, I am in my 40’s, but putting a companion down requires some support, and my wife was at work.